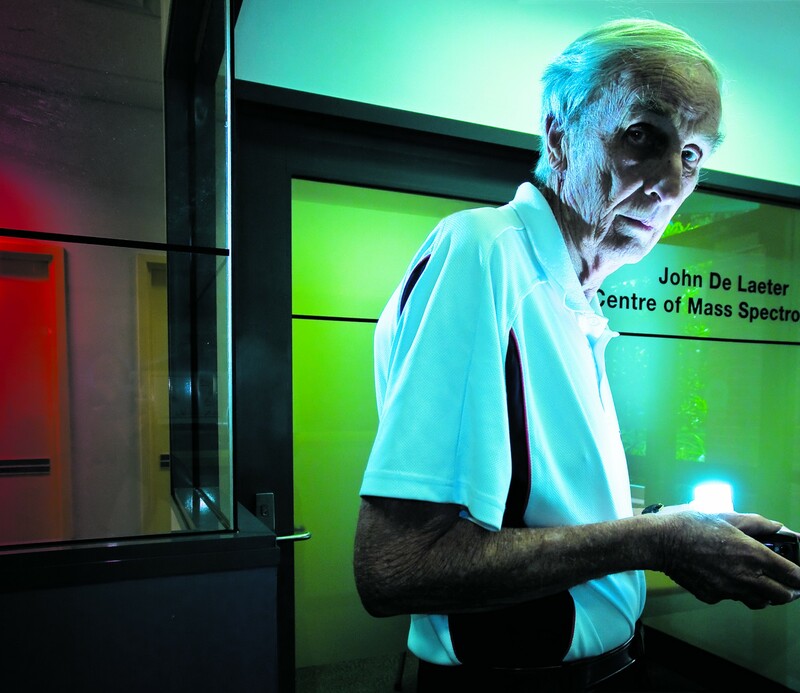 John Robert de Laeter, AO, FTSE, FAIP (3 May 1933 – 16 August 2010) achieved first class honours in physics and education at UWA, and then began a career as a science teacher. Shortly thereafter, he was inspired to return to scientific research, and completed a PhD thesis at UWA on the isotopic composition of terrestrial and meteoritic tin in 1966. After pursuing research in nuclear physics at McMaster University in Canada on a National Research Council of Canada Fellowship, de Laeter returned to Australia as the first head of the Department of Physics at West Australian Institute of Technology (which would later become Curtin University) in 1968. He took on several senior roles at the university, including the Dean of Science, Deputy Vice Chancellor of Engineering and Science, Acting Vice Chancellor and Deputy Vice Chancellor of Research and Development at Curtin, and also took on various roles with the CSIRO, such as membership of the CSIRO Western Australian State Committee, Chairman of the CSIRO Western Australian State Committee, and membership of the CSIRO Advisory Council and the CSIRO Board. de Laeter’s research mostly revolved around the application of mass spectrometry techniques to cosmochemistry, geochronology, and nuclear physics. Among numerous career highlights, he measured the atomic weight of twelve elements, helped clarify and understand issues around long-term nuclear waste storage, and mapped the geological ages of many regions of Western Australia. He advocated for, and set up, numerous centres of scientific research and outreach: He established the eponymous John de Laeter Centre of Mass Spectrometry, where colleagues would later date zircon crystals from the famous Jack Hills region of WA at 4.4 billion years old — the oldest minerals yet discovered on Earth. He helped establish the Science and Mathematics Education Centre at Curtin University, the Scitech Discovery Centre in Perth, and the Gravity Discovery Centre near the Australian International Gravitational Research Centre. John was also a member of the Australian SKA Consortium and provided early support towards the establishment of the Murchison Radio-Astronomy Observatory on Boolardy Station.